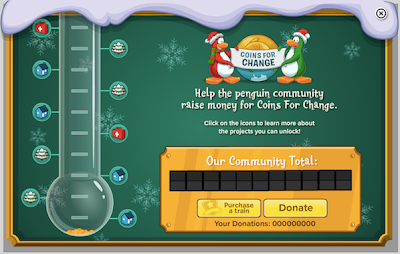 Club Penguin Cheats by Mimo777 Club Penguin Cheats by Mimo777: Coins for Change Begins Soon! Every year, millions of penguins donate billions of virtual coins to show their support for real world causes. And Coins for Change is almost here! This year, Club Penguin doing things a bit different. Take a look at what they're gonna do! We started thinking about how the Holidays bring people together... when you work together you can make big things happen! We've decided that instead of 3 separate donation boxes, why not work together to support 10 projects! As you donate virtual coins, you'll help us unlock each project.